Higher royalty payments by Indian subsidiaries of foreign companies bring in better technologies but can hurt the interests of minority shareholders. Back in 2000, Nestle India was paying an annual royalty fee of Rs 56.73 crore accruing to its parent company NestlÃ© SA in Switzerland. At 43.46 per cent of total profits, the amount was large enough to come under the scrutiny of India's income tax department, which promptly asked the company to justify the payment. The tax authorities charged that of the three major services that the parent company rendered its New Delhi-based unit to justify the royalties in 1999-2000, just one - grant of licences to manufacture and sell some products - had actually been provided. Moreover, Nestle India already had access to other two services much before it started paying hefty royalties to the parent following the economic reforms in the early 1990s. Nestle India disagreed. The case then moved to the Income Tax Appellate Tribunal, which ruled in favour of the company mainly on two grounds: NestlÃ© India's dependence on the parent firm in order to stay competitive, and lack of evidence to substantiate the charges made by the tax department. Eleven years later, the bogey of royalties is back in the boardrooms of multinational corporations. The more recent trigger is a decision by the Ministry of Commerce and Industry in April last year to remove the cap on royalty payments to overseas parents. Indian units of MNCs, like subsidiaries elsewhere in the world, pay royalties to their foreign parents for various reasons. For instance, auto and capital goods makers have to buy technical know-how and support via collaboration. Drug companies pay for marketing rights, while consumer goods firms fork out money for brand equity. Nothing wrong in principle but there are two cause-effect scenarios to such payouts: one, higher royalties affect minority shareholders by way of lower net profits that can potentially be paid out as dividend, Two, such payouts have an impact on tax collections. Royalties are taxed at source at a rate of 10.56 per cent, and corporate profits at a rate of 42.23 per cent for foreign-owned companies. Prior to April 2010, such remittances made by Indian resident firms to foreign collaborators were capped at a lump sum of $2 million and royalty payment at 5 per cent on annual domestic sales or 8 per cent on exports without prior regulatory approvals. If there was no technology transfer, royalty payments were permitted up to 2 per cent for exports and 1 per cent for domestic sales. All such caps were removed retrospectively from December 2009. And, foreign-controlled Indian units did not waste time. India's largest carmaker Maruti Suzuki hiked its royalty component to 5.1 per cent of net sales in April-June 2010 from 3.4 per cent in the preceding quarter, resulting in an additional payout to its parent, Suzuki Motor Corporation. The news did not go down well with investors and the Maruti scrip sank over 12 per cent to Rs 1,191.45, a 52-week low then. It wasn't just a short-term blip. Despite higher sales growth, the stock has depreciated by over 13 per cent in the past seven months, in sharp contrast to peers such as Tata Motors and Mahindra & Mahindra, which have appreciated by over 52 per cent and 15 per cent, respectively during the same period. The 11-share BSE Auto Index has risen 6.5 per cent. Today, Maruti Suzuki pays royalties on almost all of the 15 models it sells in India - except for the Omni, Gypsy and 800 models. Royalties as a percentage of net sales have gone up from 2.5 per cent in 2006-07 to 5.2 per cent in April-December 2010. If the company ends this financial year on net sales of Rs 35,670 crore, as predicted by analysts, it will end up paying Rs 1,800 crore to Suzuki Motor Corp. as royalties. The reason for the rise in the royalty payments over the last few years, the Gurgaon-based company says, has been largely due to the introduction of new models such as Swift Dzire, Ritz and Eeco. It also pays royalties for the new K-series engine that powers cars such as Alto-K10, WagonR, Swift, Estilo, and A-Star. In an October 2010 report, Mumbai-based Kotak Institutional Equities punched holes in that argument. It pointed out that the research and development expenditure as a percentage of sales for various automakers - Honda Motor, Toyota Motor, Volkswagen, Ford Motor and Suzuki Motor - has averaged between 4 and 4.5 per cent over the past two years. The Hamamatsu, Japan-based company spent about 4.4 per cent of sales on R&D in the financial year ending March 2010, and within this limited framework, 5 per cent of sales being charged to Maruti as royalties seems on the higher side. Adds Vineet Hetamasaria, auto analyst at Mumbai brokerage Pincmoney: "Maruti is a cash cow for Suzuki. The Indian market is one of the fastest-growing markets for Suzuki worldwide and the company wants to extract the maximum out of it. India is going to be the R&D hub for Suzuki. By 2012, Maruti will be spending close to 3 per cent of its sales on the in-house R&D centre coming up in Rohtak in addition to the existing royalty payouts." In effect, this will be 8.2 per cent of net sales if the current payout percentage continues. Maruti is clear that its royalty remittances are now aligned to Suzuki's global standards. "In the past, Suzuki Motor made requests with the Indian government to let them raise the royalty charges from Maruti and make them on a par with other subsidiaries globally, but the authorities did not allow this under the previous rules. Today, the royalty payment rates are the same across different subsidiaries," says R.C. 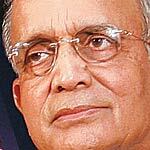 Bhargava, Chairman, Maruti Suzuki. "It's unlikely that the payouts will increase in the future." 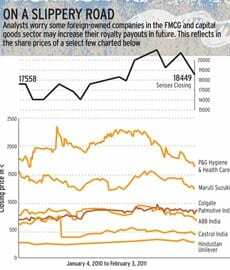 Analysts say minority shareholders feel cheated and the decision to hike royalties has marred the company's margins and free cash flows. "The increase in the royalty expense will result in additional royalty remittances of about Rs 800 crore in the current financial year (over the past year). The decision has affected earnings and cash flows at a time when questions are being raised about Maruti's ability to sustain margins in the midst of rising competition," says Kaushal Maroo, analyst at Religare Capital Markets. The bad news for minority shareholders is not restricted to Maruti alone. Consumer products leader Hindustan Unilever has increased its royalty payment to parent Unilever in recent times. From 0.7 per cent of sales in December 2009 to 1 per cent now, the spike happened as the Anglo-Dutch parent reworked its decade-old deal with the Mumbai-headquartered subsidiary on specific brands whose trademark is owned by Unilever. Religare estimates the increase has hurt Hindustan Unilever earnings by about 2 per cent. Rival Colgate Palmolive India has raised its royalty payments by 20 basis points (as a percentage of sales) to 4.3 per cent in financial year 2010, says a Pinc Research report. "Colgate India pays royalty for brand name, licence and technology. It looks like a major part of that includes brand name because manufacturing techniques and processes provided by Colgate USA are common even among local FMCG players," says Aniruddha Joshi, FMCG analyst at Anand Rathi. Analysts expect a similar hike in royalties by the Indian units of large engineering firms such as ABB, Areva T&D, Cummins and Siemens, which are listed on stock exchanges here. 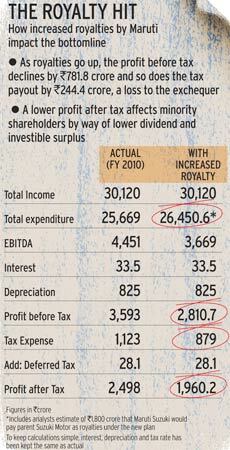 In fact, for ABB India, the royalties and technology fees have gone up substantially over the past three years. Despite a meagre 5 per cent sales growth and 28 per cent drop in net profit, the company's remittances on account of royalties and technology fees have gone up by 39 per cent between 2007 and 2009. ABB India pays royalties to the parent firm for trademark, technology used in making power products and support for bidding of projects outside India. One reason, to be sure, for the removal of the cap is that a growing economy like India needs support by way of new technologies, products and brands. Parent companies spending huge sums of money on R&D need compensation, and regulatory barriers should not come in the way of sharing their expertise. But with so many companies making large royalty payments, it is difficult to analyse the fair value of such payments. The tax department says its job is to find out whether the royalties paid are at an arms-length price or a rate at which two unrelated par ties agree to a price. "Benchmarking intangibles such as know-how, patents, copyrights and trademarks can be challenging," says R.N. Dash, Director General of Income Tax, International Taxation. Royalty payments are made by 75 companies in the BSE 500 universe and accounted for over 40 per cent of the total dividends declared in financial year 2008-09. Higher royalty payments seem to be a double-edged sword. While they promise the inflow of cutting-edge technology into the country, minority shareholders risk losing out on capital appreciation and dividends.